In the 21st century we have an amazing amount of knowledge at our fingertips. This includes the human genome sequence – (most of) the 3,381,944,086 letters of DNA code for a human, known as the human genome sequence. It’s publicly available and you can look it up or download it if you have a computer with internet. Maybe some of us in the developed world are even starting to take it for granted. The downloadable sequence is just a reference – each one of us has our own unique variation of this standard. Many of us now have reason to find out the sequence of one of our own genes, for example to see if we have inherited a higher than average risk of cancer, or if we carry a gene for a genetic disease. It’s even possible to get your own whole, unique, genome sequenced (at a cost). In the 1980s the human genome sequence was a dream. Using the technologies available at the time we’d still be sequencing by hand. The Human Genome Project led to a lot of automated sequencing methods being developed – and they’re still being improved, which is still bringing the cost of DNA sequencing down. This huge project was undertaken by many laboratories across the world. It was intended to be, and has been, a resource for improving health care. It’s not the only sequenced genome. Simpler organisms like viruses and yeasts, which have much smaller genomes, were sequenced before the human genome, and as time goes on we’re getting genome sequences for more and more living things. So how was the human genome sequenced? There are a range of basic techniques and tools that allow DNA to be manipulated and read. I’ve put together a Prezi which gives a visual overview of these tools. To see this Prezi with more detailed explanations click on the link above. DNA can be thought of as a long string of “letters” (nucleotide molecules) strung together. This makes up the code of life and it’s translated into a different language that can make any of the huge variety of proteins, like collagen, haemoglobin, insulin or botox. DNA can be cut, rearranged and joined back together. This makes it very versatile – it can be manipulated. It can be cut up and pasted into different organisms and the host organism will treat it like its own DNA – because the code of life is universal. Another useful feature of the DNA molecule is that it’s made of two strands which pair together and each one can be made anew from its partner. Thus we can make new DNA in the test tube. One DNA strand can also find its partner so we can find or pick up a whole piece of DNA if we have a just a small section of its partner. 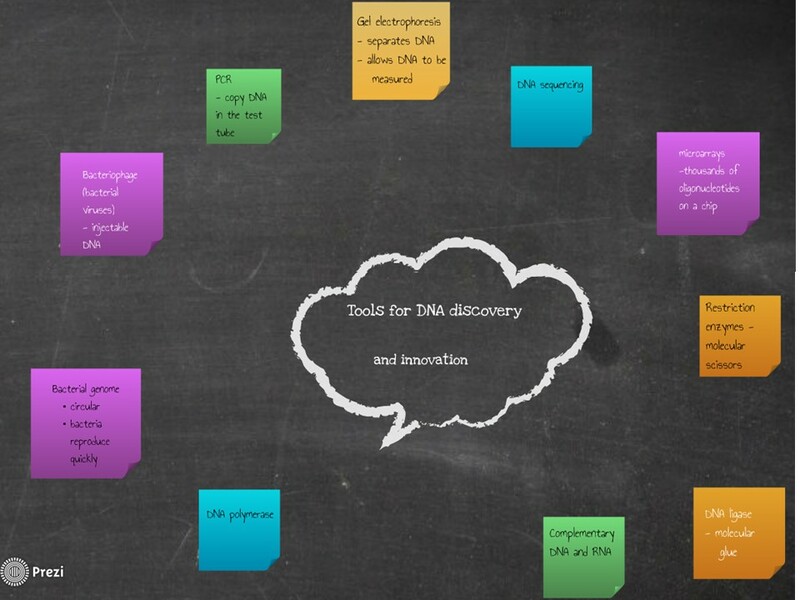 So these tools for DNA analysis can also be used for our own purposes – for example. to make proteins such as human insulin in massive amounts. You can even make a gene from scratch if you know the code of the protein you want to make. But you’ll still need a live organism to process it into protein for you. Amazing! Diabetics used to rely on pig and cattle insulin, but the human version is better for us!